My students will do just about anything for a treat, and they have this almost obsession with bringing in change for different causes. As a school we've collected change for Pennies for Polio, brought in change for the Holiday Shop, etc. I saw this ice cream bank from Shop Bando (my newest favorite online store) and I was compelled to buy it for my classroom. I don't have a lot of spare funds to get treats for my kids, but maybe if we work as a class then we can have them a little more often on a Friday afternoon. Find a penny? Add it to the bank! Don't need the quarter? Add it to the bank! Class gets a compliment from another teacher? I'll add to the bank! When we reach enough, then we can vote for our class party... maybe hot chocolate in the winter, or popcorn during silent reading, or an otter pop on a warm afternoon. Just something to make learning extra fun... with a side of motivation tucked in there too. I'm so excited to share this with my students. This year I decided to do something different for their parent gifts. I had them create Van Gogh's Starry Night on an 8 x 10 construction paper. I've done the project in the past using pastels, sometimes with watercolors, but this time I chose this mixed-media design by Deep Space Sparkle. It involved tempera paint, pastels, and construction paper - all completed in about one hour. I liked how she broke down the steps and made it super easy for students to visualize the project. The week before break we started our Fraction unit... which starts with a lesson on Factors. We've been doing Factors for a while, so it wasn't anything new... to make it a little special I had them create poinsettias (or their version of poinsettias). I gave them either a piece of pink or red construction paper and a piece of black. They folded up the pink/red into smaller rectangles and cut out the petals, then had to create 4 petal flowers that were glued onto the black background. Each petal had one factor number pair. For example if they chose the main number of 24 - the petals had 1 x 24, 2 x 16, 3 x 8, and 4 x 6 written on them. So many main numbers had exactly 4 factor pairs, so these flowers have a lot of variety. It also makes my classroom look extra happy. :) Just a little thing to combine math with art... and that makes my students a little more engaged the week before break. What parent gifts did you give this year? How do you solidify the factor concept? Please share! That day before break, I once again had my students create Sugar Cube Missions. It's pretty simple to create and it doesn't give me a headache. :) I should explain that the last day before break it's basically a full day party in our PJs. Before PE/Recess: Correct HW, Listen to the choir singing, open presents (so I can write thank you notes during the movie), start watching the movie "Charlie and the Chocolate Factory". Between Recess and Lunch: Play a Book Swap game (like the White Elephant game) - students bring in a book and then we pick numbers, choose books, and swap when needed. It's fun and totally optional. We also watched the rest of the movie and had hot chocolate (in the crockpot) with popcorn cups. After Lunch: Friend Friday Reading (partner reading), Sugar Cube Missions, clean up/pack up, Fun Friday with the grade level. See - an easy fun day! Families were asked to bring in sugar cubes and white frosting. I picked up a couple of lasagna boxes (for the roofs), spice drops (for bells), and then pulled out our candy box and grabbed other options (peppermint candies, smarties). The leftover marshmallows from our hot chocolate that morning also were pulled out for use. Each student was given a heavy duty paper plate, and they went to work creating their mission. Now why do I do missions, instead of gingerbread houses? Because we have been knee deep in learning about them. We learned about how the Spanish built them, and all the disasters that have occurred. This year it wasn't raining (Praise God! ), so we completed the creating outside. One long piece of butcher paper kept everything neat and tidy. Super easy to just roll up the paper afterward to throw away. When done the students had the option of doing an "Earthquake Challenge". They had to walk to the far building and back while carrying their creations. 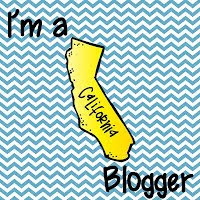 If they didn't fall apart then they were deemed earthquake proof. When we do this inside the challenge is to maneuver through the desks in an obstacle course. It's fun and an easy way to see who will be able to carry them home at the end of the day. How did you celebrate winter break with your students? Hi Everyone! I hope you are having a fabulous break. Goodness knows, we NEED it! I wanted to share a few pictures of what my Christmas has consisted of so far... I love this time with my family. My boys have kept me busy. Hubby had to work a lot last week, so I had my boys help tackle all those before Christmas projects... We hosted the big family meal (which meant a lot of extra cleaning since my parents and inlaws would be coming over - ha ha), so to keep the boys busy I had them make the place cards and decorations for the table. These little trees were wooden doll bodies that they painted in different shades of green, and then decorated with puffy paint. I had these little star/snowflake stickers that they attached to toothpicks, and placed in the top hole of the tree. All in all they were so cute and helped make our table festive. I had to go to the grocery store on Christmas Eve for fresh bread and ended up finding three of these five drawer units too. It's a wonder what the grocery store carries... Now, my boys didn't know it at the time, but they were getting new "big kid" desks and I wanted everything organized... no more pencil boxes upon pencil boxes of art supplies. I ended up taking rainbow color stickers to help them sort their supplies and they fit perfectly on the shelves of their new desks. My older boys have been using folding tables as desks for the past 2 school years, so between their excitement over a real desk, and my kindergartener's excitement over having a big boy desk - well it made for a happy, functional Christmas present. Hope your holiday was fabulous! I'm just going back in time, catching up on what's been new this year. This is the first year I am incorporating writing into novel art projects. 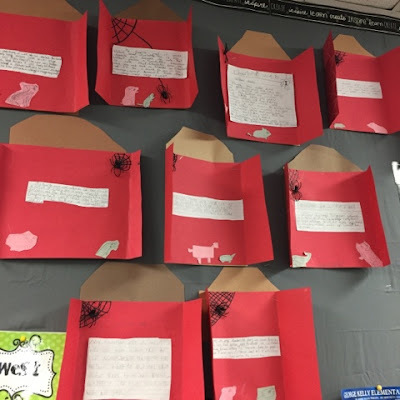 When we finished Charlotte's Web, the students took a piece of red paper and folded it to make a barn, the outside edges have white crayon X's on the barn doors, with the brown piece of paper for the roof. They then used pink and gray paper to create Wilbur and Templeton, with a black sharpie to create Charlotte's Web, and a plastic black spider glued onto the web. Their writing was pretty simple, they wrote about their favorite part of the book. 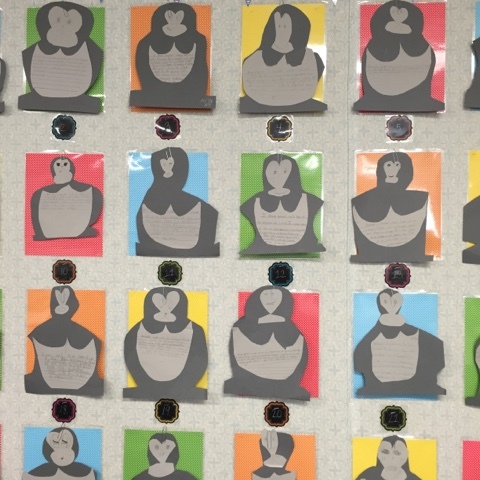 Oh Ivan... We finished the book the week before Thanksgiving, so for a culminating opinion writing activity my students created their own version of Ivan. I took 2 shades of gray construction paper and cut them into 3 different sizes. The dark gray was 9 x 12, the light gray were 9 x 6 and another 4.5 x 6. 1. 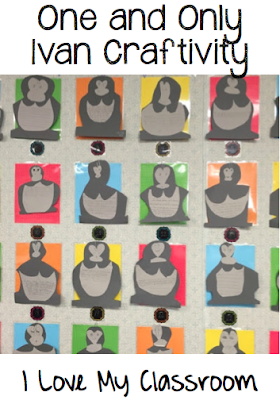 The students took their fists and placed it on the top of the dark gray paper. They drew a large half circle around their fist to create Ivan's head. From there we drew diagonal lines from the base of his head to the outer edge of the paper for his shoulders. We then cut out that portion of the paper. We moved to his feet and made 2 cuts into the paper as far as their scissors would reach with one snip. From there we cut a curved lines on each side from his shoulders to his feet. 2. The light gray paper was a different story. The students took the larger of the 2 pieces, and turned it horizontal. We drew a W on the top middle, then cut it out for Ivan's chest. Then we drew a large U from the outer edges of the W. You can see the shape in the pictures. 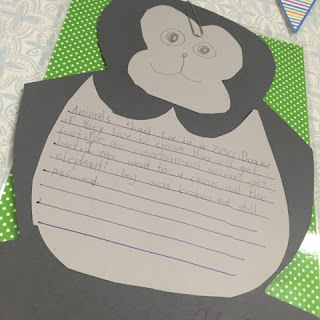 :) This became Ivan's belly, where they had to write their opinion paragraph. 3. For Ivan's head, we took the smallest of the papers and drew a large heart on it, then we drew an oval at the base for his mouth. We cut out the outside lines of the heart and oval, then glued it down so we couldn't see any of the other lines. 4. They then had to write an opinion paragraph on where they felt that animals should live. 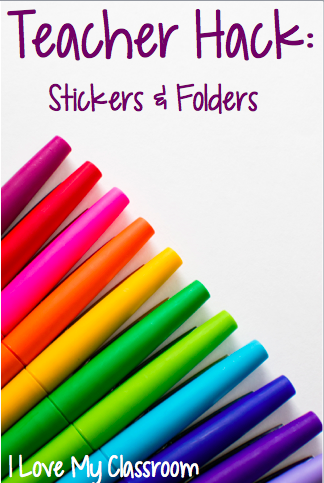 Stickers and Folders - They Help! At the beginning of the year I put stickers on all their name tags. Just these four colors to divide them up into 4 basic teams. These have made it so easy to have them easily split up for grouping. These aren't for everything, but when I want to mix them up and still give them a little choice about their partner/group, then it works well. 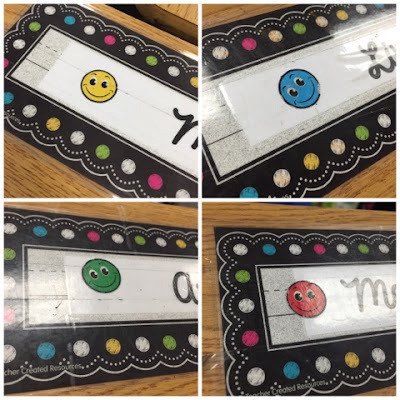 I waited until about the 3rd week of school before I added the stickers to the name tags, since I wanted to make sure I knew who I wanted to be in which color (making sure what students should be together vs. separate). This year I also implemented these 3 folders. Super easy... I usually have specific dates that things are due. Reading logs are due on Thursday, Grammar and Spelling on Friday. In the past I would always have things come in on the specific days and then I would be grading all weekend long... 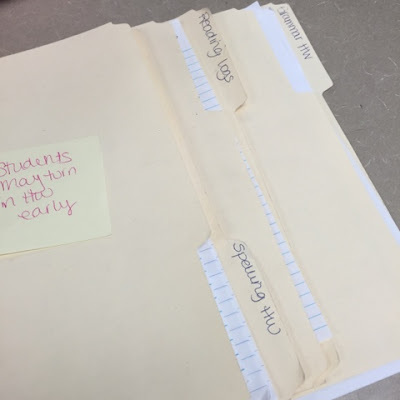 This year I decided to let kids turn things in early. By using these 3 folders it keeps it all organized. Every morning the kids come in and get out their homework. Their math stays on their desk to correct, but if they have any of these three done early they hand them to me directly so I can sort them immediately. I'm usually standing by my desk during morning work/getting organized time as kids are bringing up their materials. By letting them turn it in early I know they won't lose their papers, and I'm able to start grading the early birds early on in the week. This has really cut down on my end of the week grading.